At our house, the kids unload the dishwasher…or at least they are supposed to. Originally it was set up that one kid would “fill” and the other would “empty” for any given week. However, what seems to have happened is that they both “empty” and whoever gets there first unloads the top rack which is of course, much easier than putting all of the cutlery from the bottom rack away. It seems Tim and I are often on “fill”. Ugh! The biggest problem with this little system they’ve concocted is that both racks are often not unloaded at the same time. 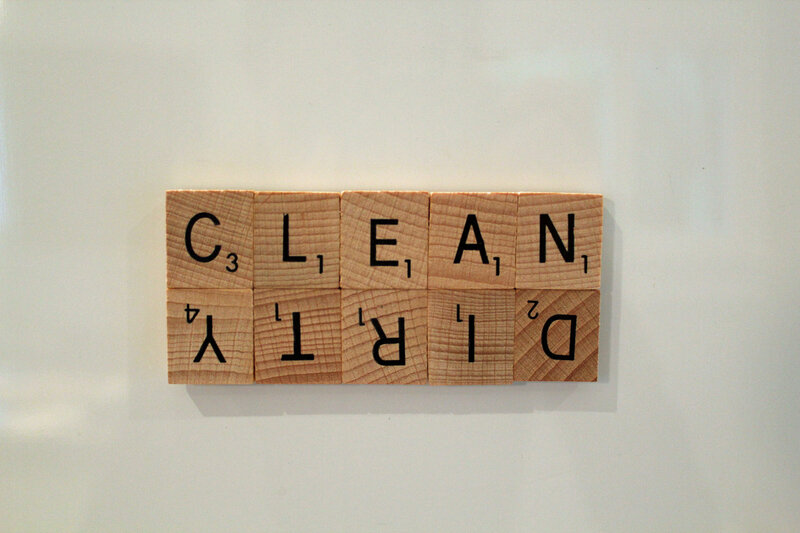 The result is that we are always in limbo not knowing if the dishes in the dishwasher are clean or dirty. Obviously the system itself needs some work, but in the mean time, I made this cute little sign to help solve our dilemma. I saw this idea online and just had to make my own. 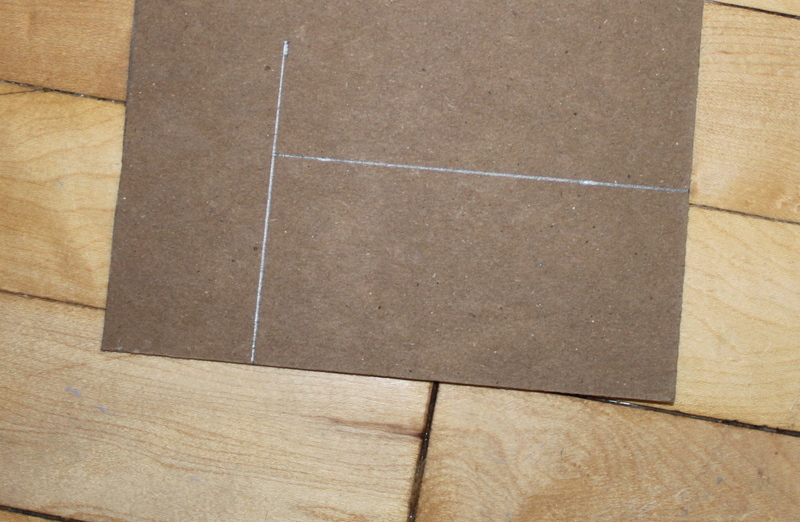 Step 1: I found a thin but sturdy piece of card board and cut it to 4 1/2″ X 2″ piece. 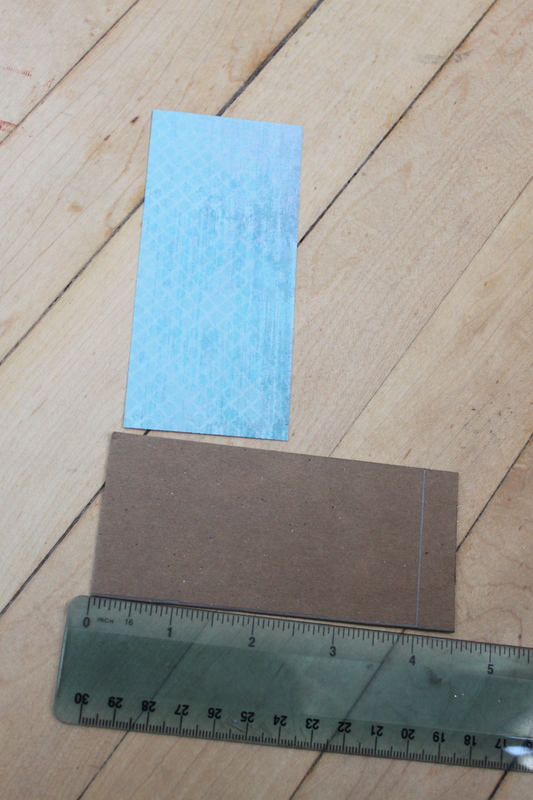 Step 2: I cut a piece of scrapbooking paper equal in size to the cardboard. 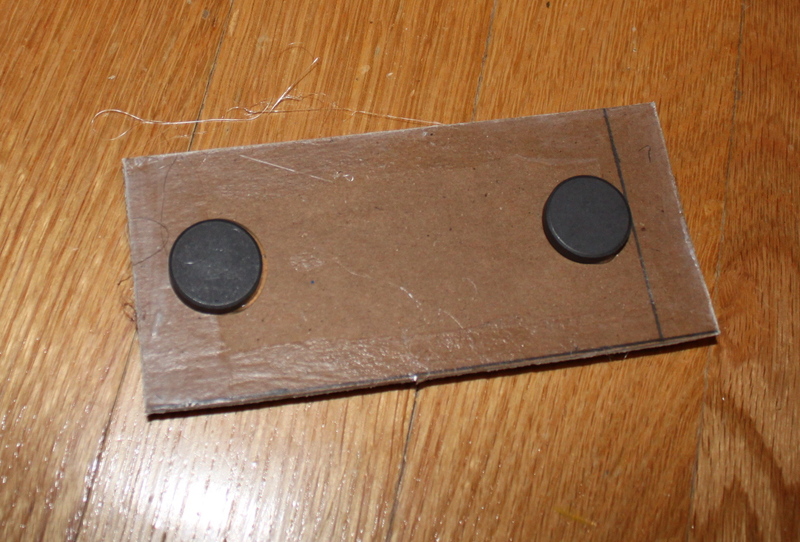 Step 3: I glued the paper on the cardboard. I also added little stickers spelling “DISHES” vertically down the left side. Step 4: I trimmed any excess paper and gave it a bit of a sand to rough up the edges. 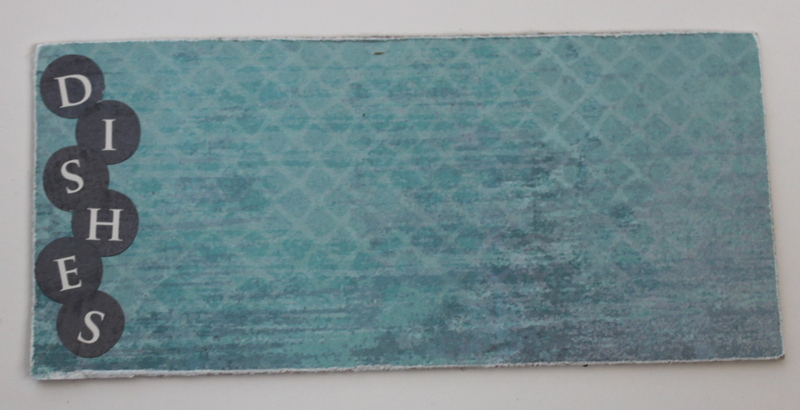 I then added white ink to the edges to hide the cardboard backing. Step 5: Put one coat of Modge Podge over top and edges. Let dry. 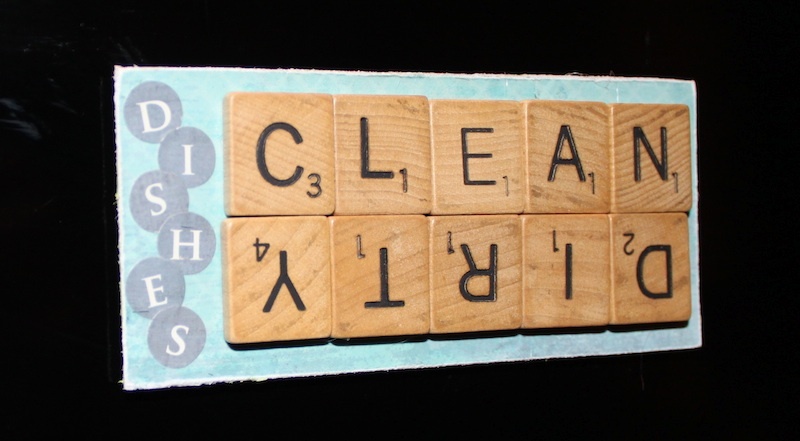 Step 6: I used my paper trimmer as a guide to be sure I set the letter tiles on straight. I hot glued the outside tiles first and they also helped to guide my placement. The project was easy to do and didn’t take long to complete (with the exception of dry times). 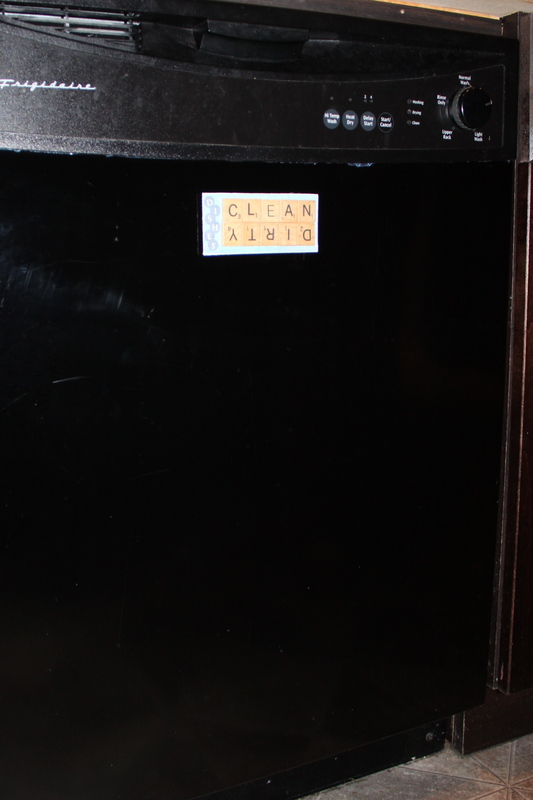 As soon as the dishwasher is turned on, the sign should be switched to “CLEAN” and then flipped upside down once the entire dishwasher has been emptied.